Solari Report we choose a hero, and one of the reasons that the heroes are so important to me is I get very frustrated when I hear people say, “Why is nobody doing anything?” because hundreds and millions of people are doing lots and lots of stuff, and we need to start paying attention to the people who are really trying to help us and honor them instead of paying attention to the people who are trying to kill us and honoring them. And so put down People Magazine, and let’s start looking at the real heroes, which the corporate media very, very rarely honors. My Heroes of the Year are Joe Cross and Phil Staples. Joe Cross is the guy who made “Fat, Sick and Nearly Dead.” Phil Staples is the Iowa trucker who joined him in his juice fast. Joe made the movie a couple years ago, which is why it’s not Movie of the Year. Joe Cross continues to be on the Internet, making the movie available for free, and advising and encouraging people to do what they call the “reboot,” which is using juicing. 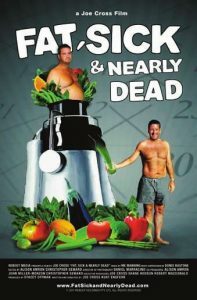 points out during the movie is that Phil goes to Wal-Mart and buys a whole bunch of vegetables, and across the screen it points out it’s $14.00 a day to provide nutrition through juicing buying conven-tional vegetables. Then Phil goes to a health food store, and the box comes out, and it’s $28.00 a day, twice as much to do it organic. And then Phil compares that to his brother’s heart attack, which cost $55,000.00, and in those simple three numbers, and in watching Joe and Phil go through their incredible transformation in terms of their health and the diminution of their healthcare budget from simply getting healthy and not being sick, you see in one or two simple little stories a plan to completely solve 80 percent of America’s healthcare problems on the “just do it” method. And it proves how one entrepreneur with a video camera can walk into the middle of a giant national healthcare debate that is going around and around in circles and dead ends and solve 80 percent of the problem with two case studies that show how solutions are there at extremely low cost that are very feasible for most of us to do. And it’s a reminder of the power of what a small group of people can do if they just go at a problem in a creative way and start intimate—with their own lives and the lives of those around them. So Joe Cross comes clean in the healthcare and diet area and literally unfolds an example that is a tremendous part of real solutions. So it’s the “just do it” answer to Obamacare. Remarkable, inspiring contribution from two wonderful men. and very public in telling—holding up a mirror to the Americans.